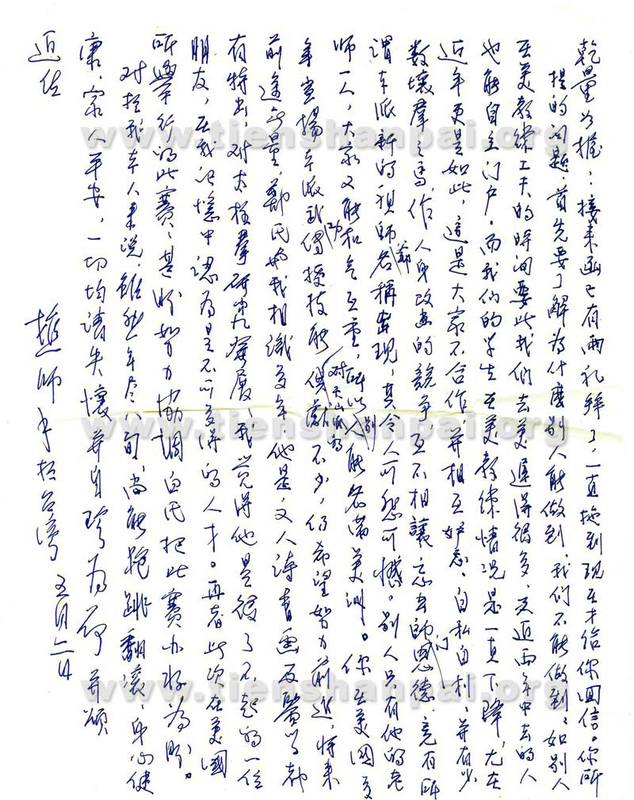 When my Shi Ye (direct teacher) was alive, we made a point of staying in regular contact with each other through phone calls, letters, and visits. He shared with me his hopes that his students would spread our wonderful art of Tien Shan Pai throughout the world and work cooperatively to achieve the global vision that he had for martial arts. As he approached the end of his life, however, he expressed concerns about the state of Tien Shan Pai and the direction it was heading, especially in the United States, where several of his senior students resided. The letter posted here is one example of the feelings that he shared with me. 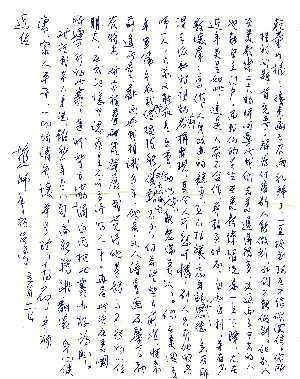 I have provided both the original Chinese letter, which was sent on May 2, 1989, and an English translation, which I have tried to make as accurate as possible. 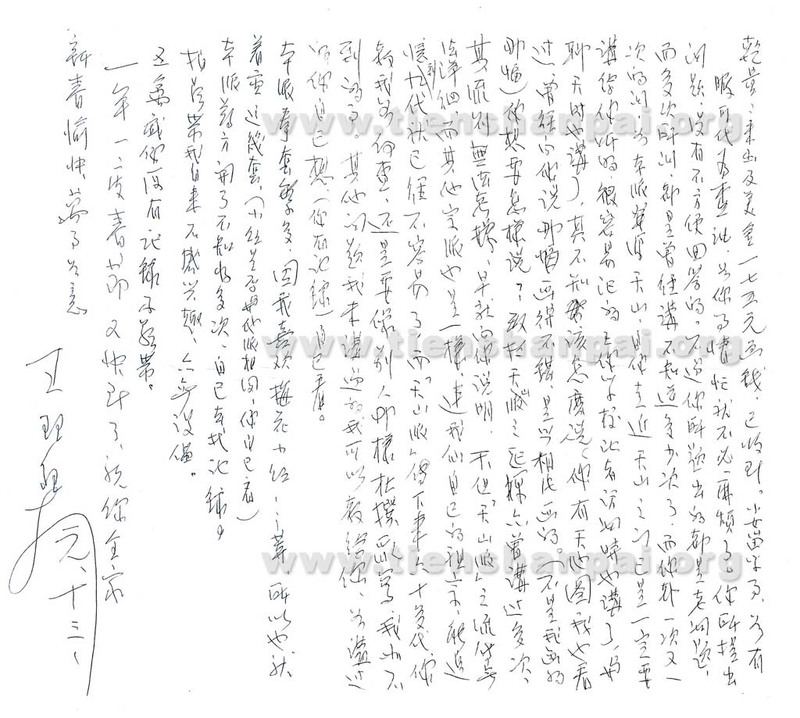 His letters, along with our phone calls and visits, both in Taiwan and the United States, helped me appreciate how important it was to Shi Ye that I commit myself to his vision, and they compelled me to work through all challenges that have arisen so that his wonderful legacy will endure. 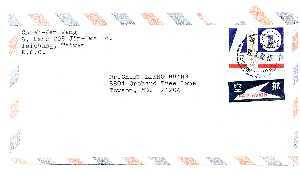 It has been two weeks since I received your letter. The question you raised: First, we have to understand why other people can accomplish it but we cannot accomplish it. Other people teaching kung fu in the United States arrived much later than us; especially in the last two years, these people have been able to establish themselves. By comparison, for our students teaching in the U.S., the condition is going down, especially in recent years. This is due to an unfortunate lack of cooperation as well as rampant jealousy and selfishness. Furthermore, there are a few “bad horses in the herd” who have launched personal attacks in order to advance themselves with no regard for others. We have even had the appearance of a so-called new founder name for our style, which was done with enmity and in blatant disregard for our sacred traditions. Such lack of respect and gratitude is appalling and runs counter to our martial ethics. Other people have only one teacher, respect each other, and have had more success in the Pan-American area. Consequently, these schools have grown and achieved more success. You have been teaching in the U.S. tirelessly for many years, promoting and teaching our style’s martial arts. You have made tremendous contributions to Tien Shan Pai. I hope you continue to work hard and move forward. Your future will be bright and boundless. Mr. Cheng and I have known each other over the years. He is an accomplished poet, painter, and writer. In addition, he has studied medicine and has also made significant contributions to Tai Ji Quan. He is a rare find. Finally, please accept my best wishes regarding your upcoming tournament. I hope that through your hard work and the support of the Tien Shan Pai community in America, the tournament will be a great success. As for me, I am fortunate to be able to run, jump, roll, and turn my body at nearly 80 years of age. I am also grateful that I still have sound mind and strong body. My family is well. Please take care of yourself. I have received your letter and the $175.00 for the painting. My youngest daughter is coming to America to study. Do you have time to help her get established? With regards to the questions that you have raised, here is my response. All of the questions you have raised have already been answered many times yet you continue to ask. I have shared with you, without reservation, the history of Tien Shan Pai. As you recall, we have discussed this on several occasions both during an interview by one of the students in your school and in our many chats. I really don’t know what else to tell you. You have the Tien Chi Tu [translator’s note: a painting of a lake in Tien Shan]. One time, you showed it to me and I commented that it is a good painting. It is done by one of your student’s sister from a photograph (not the one painted by me). You must know what I am referring to. With regards to the origin of Tien Shan Pai, this has been addressed already. As I explained to you many times, there is no way we can get the details. Other pai [branches] face the same issue; i.e., nobody knows the details. Traditionally, it is all transmitted from master to disciple verbally and understood confidentially. Tien Shan Pai is no exception in that there are no written records from previous generations. In our personal lives, it is a difficult proposition to be able to trace nine generations. Tien Shan Pai has more than sixty generations, so how can you expect me to trace and write those down? I will not compromise my integrity by making something up, as some of the people are doing. Some of the questions, you can figure out yourself, you have recollections and records. If anyone knows, it is you. Our style contains many forms. I like Mei Hua and Xiao Hong; therefore, I have emphasized these in my teachings. As far as how Xiao Hong Quan compares with the others, that is up to you to figure out. 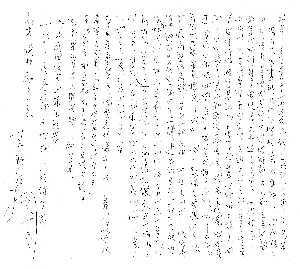 I have written so many prescriptions for you [translator’s note: this is a Chinese euphemism meaning I have already given you the answers], look to those for your answers. You already have the record and videotape of Wu Qing Xi. I’m no longer interested in making videotapes and I do not have the equipment either. Once again it is the Spring Festival. I wish you and your entire family happiness and prosperity.